International Series of Monographs in Natural Philosophy: Collective Oscillations in a Plasma, Volume 7 presents specific topics within the general field of radio waves propagation. 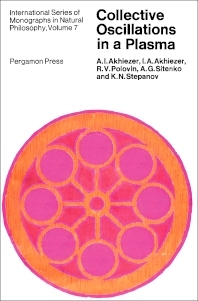 This book contains five chapters that address the theory of linear oscillations in a plasma, the spectra of the eigen oscillations, and the mechanism of high-frequency heating. The opening chapters deal with the self-consistent fields; development of initial perturbation; dispersion permittivity tensor of a plasma in a magnetic field; effect of thermal motion of particles on low-frequency resonances; excitation of oscillations by modulated azimuthal currents; and cyclotron damping of low-frequency oscillations. The next chapters describe the nature of beam instability, the fluctuations in a free equilibrium plasma, and the current causing scattered waves. A study of the probability of scattering is presented. The concluding chapters are devoted to the scattering of electromagnetic waves in a plasma-beam system and the coefficient of reflection determination. The book can provide useful information to scientists, physicists, students, and researchers.